Certainly, one of the more readily recognizable icons of labor is "Rosie the Riveter," the indefatigable World War II-era woman who rolled up her sleeves, flexed her arm muscles and said, "We Can Do It!" But, this isn't the original Rosie. In 1942, as World War II raged in Europe and the Pacific and the song "Rosie the Riveter" filled radio waves across the home front, manufacturing giant Westinghouse commissioned artist J. Howard Miller to make a series of posters to promote the war effort. One such poster featured the image of a woman with her hair wrapped up in a red polka-dot scarf, rolling up her sleeve and flexing her bicep. At the top of the poster, the words ‘We Can Do It!' are printed in a blue caption bubble. To many people, this image is "the" Rosie the Riveter. But it was never the intention to make this image "Rosie," nor did many Americans think of her as "Rosie." The connection of Miller's image and "Rosie" is a recent phenomenon. The "Rosie" image popular during the war was created by illustrator Norman Rockwell (who had most certainly heard the "Rosie the Riveter" song) for the cover of the Saturday Evening Post on May 29, 1943 — the Memorial Day issue. The image depicts a muscular woman wearing overalls, goggles and pins of honor on her lapel. She sports a leather wrist band and rolled-up sleeves. She sits with a riveting tool in her lap, eating a sandwich, and "Rosie" is inscribed on her lunch pail. And, she's stepping on a copy of Adolph Hitler's book "Mein Kampf." The magazine cover exemplified the American can-do spirit and illustrated the notion of women working in previously male-dominated manufacturing jobs, an ever-growing reality, to help the United States fight the war while the men fought over seas. The cover was an enormous success and soon stories about real life "Rosies" began appearing in newspapers across the country. The government took advantage of the popularity of Rosie the Riveter and embarked on a recruiting campaign of the same name. The campaign brought millions of women out of the home and into the workforce. 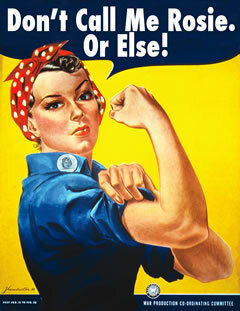 To this day, Rosie the Riveter is still considered the most successful government advertising campaign in history. After the war, numerous requests were made for the Saturday Evening Post image of Rosie the Riveter, but Curtis Publishing, the owner of the Post, refused all requests. The publishing company was possibly concerned that the composers of the song "Rosie the Riveter" would hold them liable for copyright infringement. Since then, the J. Howard Miller "We Can Do It!" image has replaced Norman Rockwell's illustration as "Rosie the Riveter" in the minds of many people. Miller's Rosie has been imprinted on coffee mugs, mouse pads, and countless other items, making her and not the original "Rosie" the most famous of all labor icons.